All workshops, groups and consultations will offer an in depth Eating Behaviour Questionnaire prior to your starting. Completing this form will bring into focus your dieting history, and your readiness to make change at the present time. These will be a dynamic look at what is important to you. Why might your next “diet” be different? Why now? How to recognize what you really want and make it different. They will include an overview of social and emotional eating patterns so that they come away with a glimpse of your own eating behaviour blueprint. Groups may be up to 15 people. Beginning as above, but a series of 12 week workshops to provide an in depth understanding of your eating behaviour patterns, and to equip you with strategies to cope. Three sets of these throughout the year are designed to help you through weight loss, and support your long term weight management. This can be offered as a single consultation, or as a continuing support. It is not designed to replace the benefits of meeting in person, or joining a group, but can be especially effective for the housebound, or for discussing a particular situation. They would always follow a preliminary phone call to assess your needs, which is free of charge. My usual charge is £45 per hour or pro rata that amount if less time is taken. Please contact Jill using the message form below in the first instance for a call back. 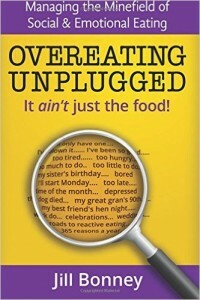 Overeating Unplugged is a collaborative process to enable each of you to discover your own unique, eating behaviour blueprint, and to become your own, best, diet detective!